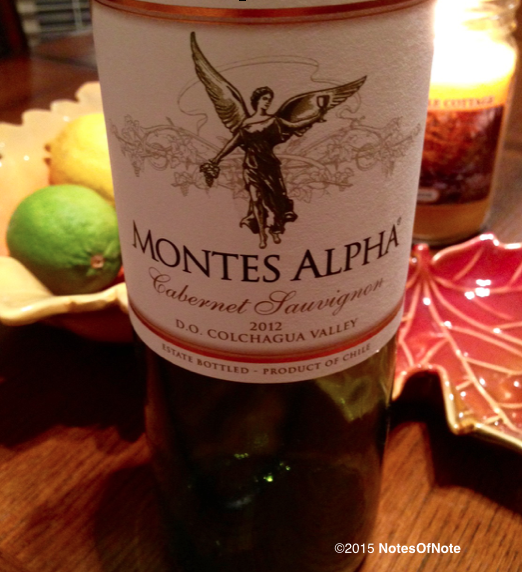 Last weekend I went on a quest for 2012 Cabernet Sauvignon, and the Montes Alpha was a specific focus of that search. The latest edition of Wine Spectator piqued my interest in its coverage of Cab, and 2012s in particular. This Chilean red (which includes 10% Merlot in its composition) lived up to all expectations, a luscious and fragrant beauty that was packed with scents of black fruit, herbs, and even a light metallic tang of some kind. This AVA in Colchagua, Chile, has a terroir that produces Cabernets that a bit of research tells me are similar to those from Pauillac in Haut-Medoc. This bottle was just under $20, though, and I suspect the French version would be at least three times that figure. Even cooler, in my mind, is that the vineyard’s grapes (from Apalta and Marchigue) are all sustainably dry farmed–they consume far less water than the norm, and produce a noteworthy outcome in the 2012 vintage. We ate Swiss cheese and mushroom burgers and some ‘crispy crowns’ potatoes alongside this red. Tasting highlights from the Wine Spectator summary read, “Blackberry, graphite, and violet on a structural core of bright acid and plentiful tannin with a long molasses-scented finish.” All that being true, the 2012 Montes Alpha is a very worthwhile drink.